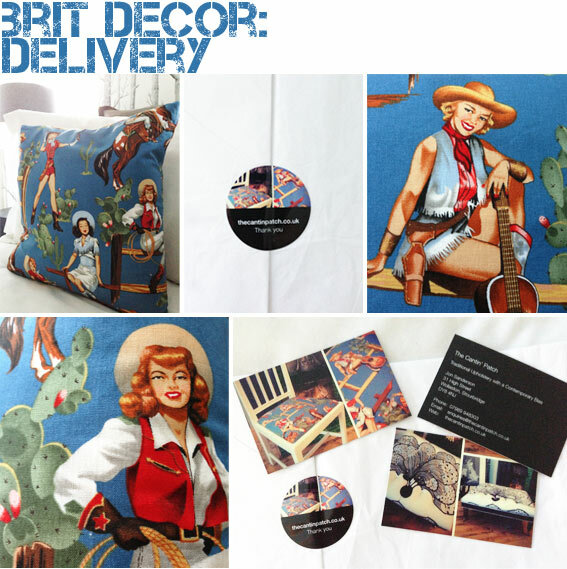 Brit Decor : Home Page: Brit Decor: Surprise Delivery! Imagine my surprise and excitement this week when my neighbour called out to let me know that she had taken delivery of a parcel which was addressed to me! I knew that I hadn't ordered any treats for the home (I have been good recently) so my mind began working overtime as I tried to guess what on earth it could be...? After a frenzied opening of the outer packaging, to my delight, inside I discovered a beautifully wrapped cushion made by The Cantin' Patch, who I recently featured on Brit Decor in a profile special. I was so touched by this gesture of thanks and equally thrilled to have my very own piece of the very talented Jon Sanderson's work in my home. I love the bold vintage style of the Alexander Henry 'Cowgirls' fabric and I really haven't stopped talking about it since so I had to share my excitement with you! Thanks for making my day and for adding a unique piece of British upholstery to my home Jon! Have you recently received a nice surprise through the post?